What is the Substitution Method? Ever had a substitute teacher? When the regular teacher is gone, you get a substitute, or replacement, teacher in his or her place. It's the same basic idea here with systems. One thing is taken out and a substitute, or replacement, is put in its place. 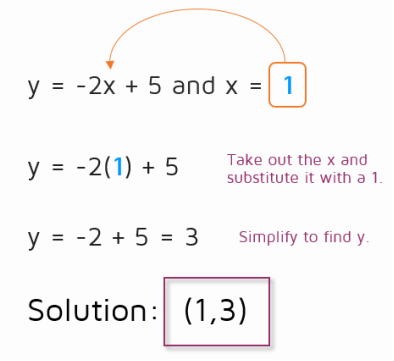 Here's an example of how you can use substitution to solve a system of equations. This is a system with two linear equations. Remember, our goal is to figure out the point where the two lines cross. This will be the ordered pair (x,y) that works for both equations. In this system, we already have half of the answer since we know that x = 1. All that's left to do is to find y. We know that x = 1, so we can plug this in for x in the first equation. We're taking out the x and substituting, or replacing, it with the 1. ​Remember to write the solution as an ordered pair. The answer is the point that works for both equations. This solution is pretty easy to check by graphing. You can see in the graph below that the two lines cross at the point (1,3).